Good morning everyone! It's sad to see our stretch of beautiful weather end, but it ends today. Rain will move in later this afternoon before ending sometime overnight. Friday and Saturday now look to be dry before another system this weekend brings more rain and snow chances. Before we get to that, the possibility is there for an additional inch of rain to fall through Sunday. While this isn't a large amount of rain, we could see some minor issues along area rivers and creeks. 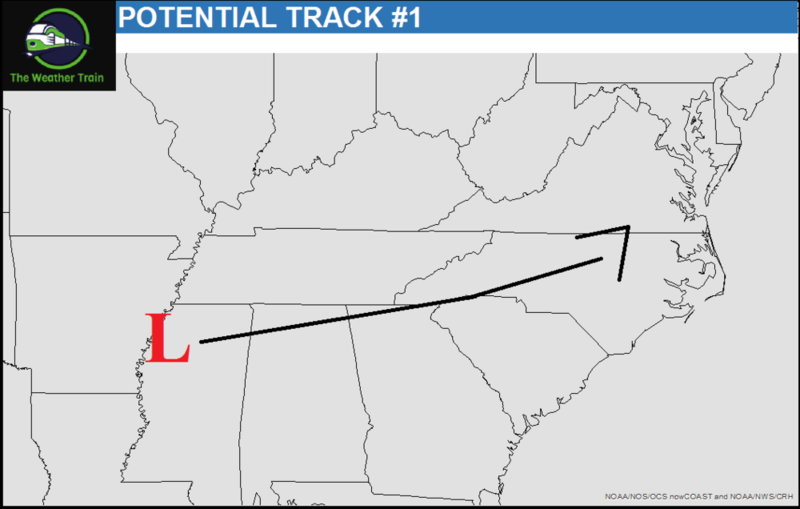 The track of the low from the GFS is similar to potential track 1 below. If the low tracks south and east of Kentucky, then snow accumulations would be very likely. However, if the low tracks closer to Kentucky or anything similar to potential track 2 below, then we should expect more rain with little/no snow. Since we are 3-4 days away, the data will continue to flop around before eventually figuring things out. I should have a better idea on that to expect sometime tomorrow, so stay tuned for the latest updates!